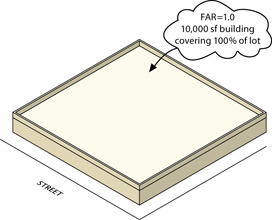 Wondering what it means when someone refers to Floor Area Ratio or FAR? 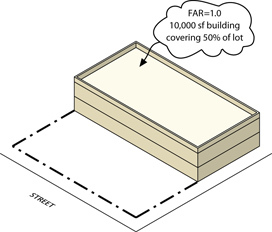 FLOOR AREA RATIO: The floor area ratio is the principal bulk regulation controlling the size of buildings. FAR is the ratio of total building floor area to the area of its zoning lot. Each zoning district has an FAR which, when multiplied by the lot area of the zoning lot, produces the maximum amount of floor area allowable on that zoning lot. For example, on a 10,000 square foot zoning lot in a district with a maximum FAR of 1.0, the floor area on the zoning lot cannot exceed 10,000 square feet. Still unsure as to how “floor area” is defined? Read on. 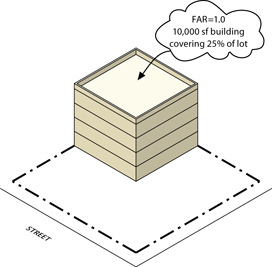 FLOOR AREA: The floor area of a building is the sum of the gross area of each floor of the building, excluding mechanical space, cellar space, floor space in open balconies, elevators or stair bulkheads and, in most zoning districts, floor space used for accessory parking that is located less than 23 feet above curb level. These examples diagram the different ways a building’s FAR can be realized. By setting back from the lot line, developers are able to create taller structures than would be possible had they filled the lot, which is part of what makes super-skinny supertalls possible. In theory, caps on FAR should prevent developers from erecting sites beyond a certain height. However, inclusions such as mechanical space don’t count towards a building’s FAR, and can result in towers rising far above the expected limit. Furthermore, developers can buy the unused FAR of buildings around them and add these to their own height–so a skyscraper might be able to rise next to a tiny church, if the developer was able to acquire the unrealized potential height on the church lot. FAR might initially be a complex concept to follow, but it shapes what is possible for developers to build–so it’s the job of all of us as preservationists to stay as alert as they are to the possible manipulations of FAR regulations. Thank you for taking the time to better understand your neighborhood and the regulations that shape it. Italicized definitions come from the New York City’s Glossary of Planning Terms.